Metal or cheap imitation irons can scorch your hair! 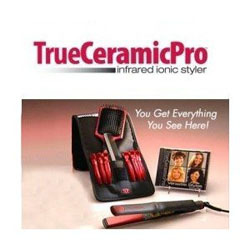 The True Ceramic Pro combines dual-sided, genuine ceramic plates with 15 millimeter solid ceramic heaters that work together to create consistent, infrared heat that straightens and curls at the molecular level. Negative ions are emitted to seal the hair cuticle - locking in the color, moisture and shine! True Ceramic Pro's baked ceramic plates are extremely durable and provide superior temperature performance. With your help we can reach more people and let them know about True Ceramic Pro Infrared Ionic Styler whether this product works or not. I purchased the above item last year and have been waiting to this PRESENT TIME for another one. I too was told that it was from a bad batch and that another one will be shipped out to me back in January. Never happened!! CUSTOMER SERVICE IS NULL AND VOID. IT SMOKES AND THE PAINT IS STILL CLIPPING OFF...I gave away my old ceramic flat iron that did a good job. NOW WHAT AM I SUPPOSE TO DO? I was excited as most of us are to get my styler. Imagine my surprise when the very first time I used it, the paint chipped off!! I didn't have it at the very highest setting, but it was smoking as well. I am very disappointed to say the least. I sent it back and after reading many reviews on other sites, will not purchase another one, as this seems to be a common problem. I read one review in March of this year in which the company claimed there was a bad shipment and that was being taken off the market. Well they missed the one I bought. I will try another brand.